Well, my post on 18th century court costume was one of my most successful, and I could not help noticing that it attracted comments from gentlemen readers. Yet it only featured one set of male clothes, the astonishing wedding suit of the Crown Prince of Sweden, future King Gustaf III. 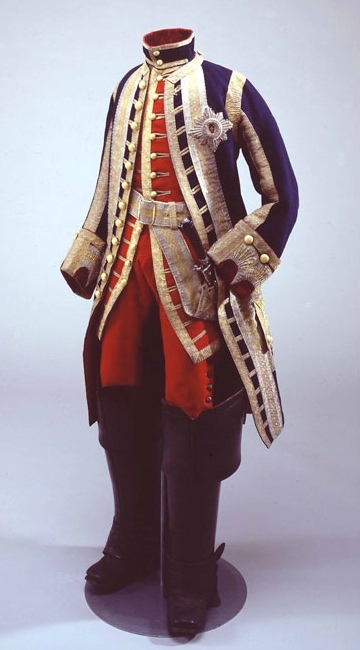 So the idea came naturally to dedicate a post entirely to 18th century male fashions. Unlike ladies’ Court gowns, they very similar in cut to regular attire. Ladies’ very wide panniers were only worn at Court, and would have looked ridiculous anywhere else. Indeed, especially during the years that preceded the French Revolution, they were widely mocked. On the contrary, the male three-piece suit (coat, waistcoat, breeches) followed the same cut as the clothing worn by noblemen and bourgeois alike in regular settings. The major difference between gentlemen’s Court attire and ordinary clothes was in the embroidery and of course the quality and cost of the fabric. It was literally ruinous. The Comte de Tilly, who was a Page to Marie-Antoinette, admits to spendthrift habits in his youth. In his Memoirs,he recalls that, when he appeared before the Queen in yet another new embroidered suit, she expressed a motherly concern in the sad state of his finances. Even hunting clothes were richly embroidered. The Royal Hunt took place in the woods that surrounded Versailles and other royal residences. It was an official event as any other. Look at this hunting suit, presented by Louis XV to Christian VII of Denmark, and displayed at the Versailles exhibition on Court Pomp and Royal Ceremony last spring. The Kings of the Bourbon dynasty were all passionate horsemen and hunters, which shows in the choice of this diplomatic gift to another sovereign. I remarked in my prior post that jewelry was de rigueur for gentlemen as well. Now you don’t have to take my word for it anymore: here is a garniture of diamonds from the Court of Saxony. The sword, scabbard and decorations are self-explanatory, but look at the bottom left of this picture: these are shoe buckles. Above are the smaller buckles that tied the breeches just under the knee. And note the set of diamond buttons, smaller (left) for the waistcoat and larger (center right) for the coat. 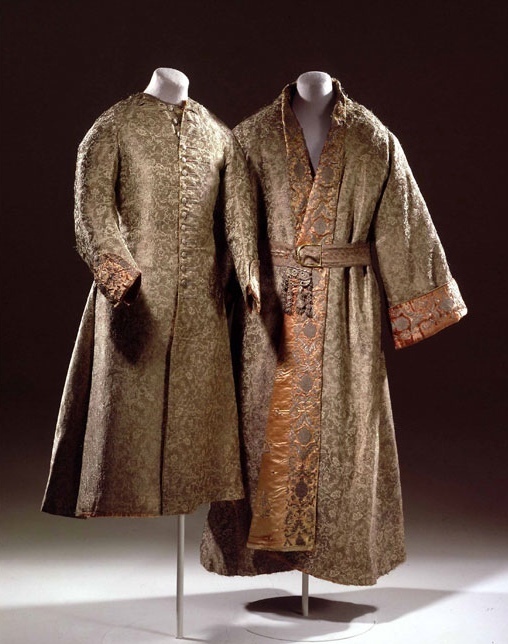 And I reserved for the end of this post these dressing gowns of King Frederic IV of Denmark, also extraordinarily opulent.